I just wanted to build my own bike and make as many of the parts as possible. So far I have made up the jig and frame in the pictures. The frame is based on the plans that I got from this site. The neck rake is 45 degrees because I like the look of long front forks. I will be building my own Springers for the front. The rear swing arm joints I made up on a small lathe. They have needle roller bearings and stainless steel pins. I machined the pins so that all that is visible when tightened them up is a 19mm circle. I think that they look good, and will make the joints for the front springers the same. The top shock absorber mountings will also be the same. 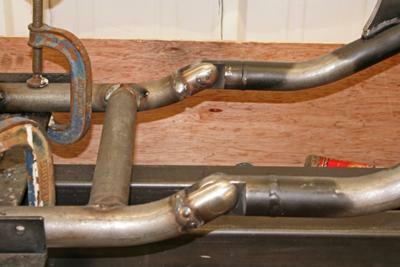 The neck tube was machined from a solid billet and is very strong. There is a lot more to do yet but thought that some people may get ideas from what I have done so far. I am using a Sportster 1200cc engine and gearbox. I am very interested to hear how this frame rides as I too purchased the plans to build. Very unusual soft tail design. I can't say I've even seen a pic of a completed one on the web. Good luck. It took about 5 months . That included turning all of the joints and headstock tube. It is not finished yet. I am at the moment making the front springer forks having just finished the engine mountings. The project is a hobby so the time it takes really does not matter . Thanks for the input as I complete another part of the build I will be posting the pics on this site. 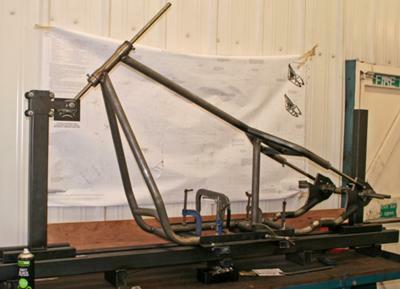 how long did it take you to build the sporty frame,and excellent job!! Will stick with needle bearings as most sports bikes rear suspension use needle rollers so should be ok for custom bike. The shocks will be on display and chromed and will use the same fitting as the rear swing arm .There are spacer rods fitted in place on picture . You may want to revisit the needle bearing idea and go back to a bushing. Minimum angular oscillation that the needle bearing would see is the worst application for them. Needle bearings like to rotate a full 360 degrees and they like to rotate in the same direction. Bushings in this application would give you the greatest longevity. Bushings are designed to handle this type of application. Your design is otherwise very clean… and the lines look great… good luck on your build! Will you hide the springs or show them off and make them look like a hard tail that really is a soft tail? Nice look'n frame. I like the way you did the rear joints. Keep us updated! I gotta update my two builds. When I get a bigger shop I'm gonna start making my own parts too. And good luck in your work!